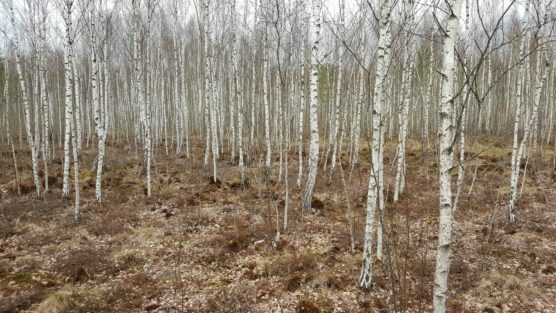 The Lithuanian Fund for Nature (LFN) and the Peat Producers Association (PPA) are responsible for five project areas covering a total area of 465 hectares in Lithuania. The areas are characterized not only by different habitat types but also in varying degrees of peatland use. The restoration of peatlands will be implemented by the construction of dams from degraded peat from the lower layer of peat substratum, which is more water resistant or by means of plastic planks. 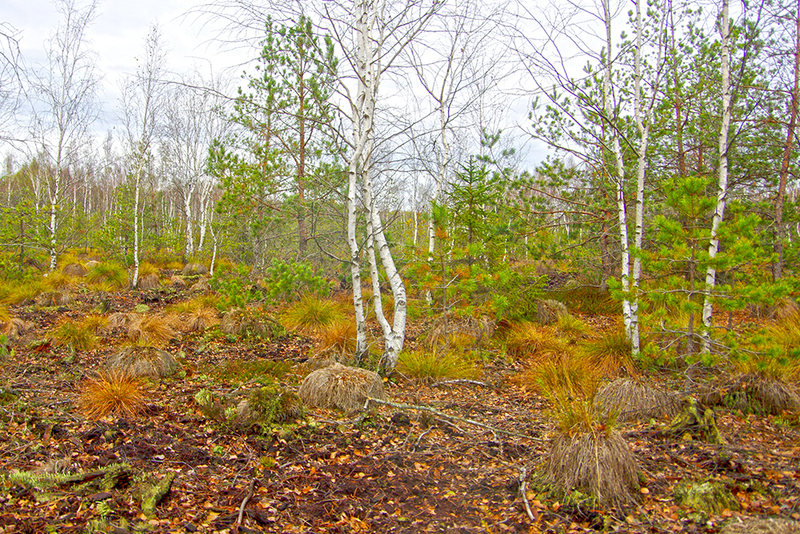 In addition, vegetation, which is not typical for peatlands, will be removed. The biomass of this vegetation will be used to fill the drainage ditches. 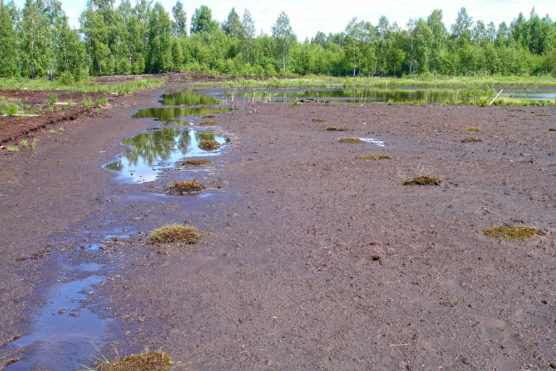 On the former peat mining areas, an attempt is made to establish peat mosses of the genus Sphagnum, which will contribute to peat growth. 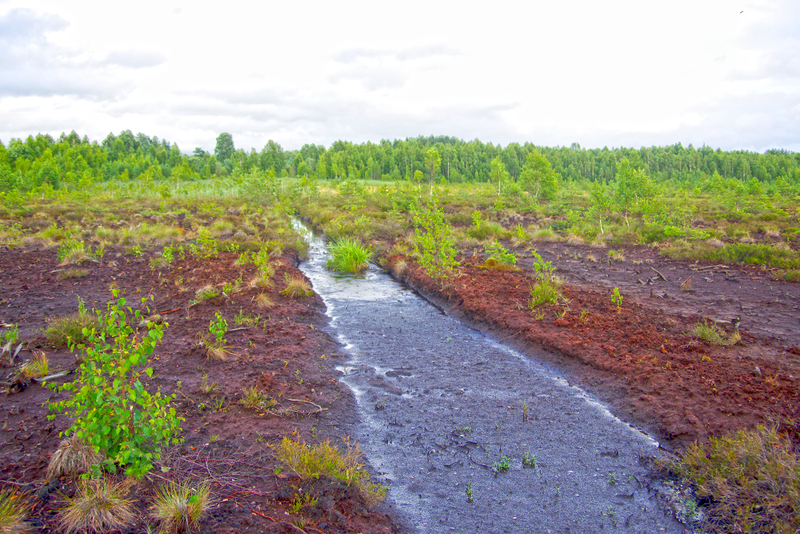 The Lithuanian sites are located in degraded and post mined peatlands, with a total area of 316 hectares. They are distributed across almost all regions of the country. Therefore different stakeholders are involved in the implementation of the project. Amalvas peatland (3637.8 ha) is located in the southern part of Lithuania. The territory is also a part of huge wetland complex – Žuvintas, which has a special protection status of Biosphere Reserve. Project aims to restore the southern, most disturbed part of the peatland which occupies 214.75 ha area. Draining of the southern part of Amalvas was carried out already in the beginning of 20th century and continued during the soviet period. As a result, fen and transitional mire habitats were lost. 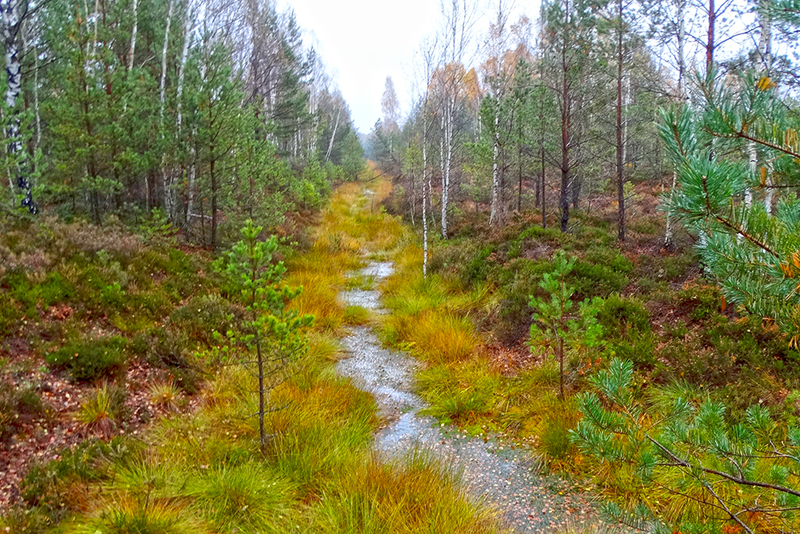 Currently only degraded raised bogs habitats (30 ha) can be found in the project area. The rest of the area is so badly damaged , that it does not meet the requirement for the habitats of European importance. 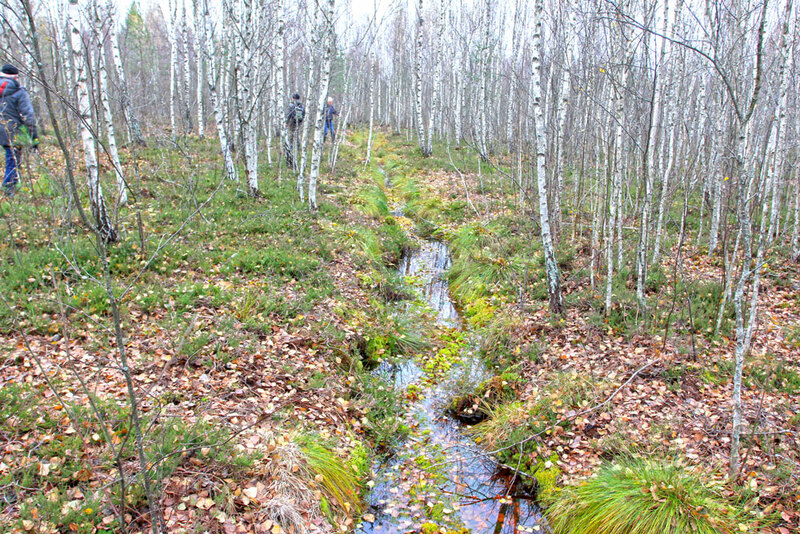 Drainage of Plinkšiai peatland leads to the loss of valuable bog habitats. Photo: Jūratė Sendžikaitė. In the 69 hectare Plinkšiai peatland, Degraded raised bogs (which may still be capable of natural regeneration) and Bog Forests are characteristic. The landscape and bird protection area, which is located in a biosphere reserve, was partially drained by ditches of a total length of 22 kilometers. Degraded raised bog in Sachara peatland. Photo: Žydrūnas Sinkevičius. In Sachara peatland Degraded raised bogs (which may still be capable of natural regeneration), Transitional and quaking bogs, and Bog Forests occur on an area of 92 hectares. Ditches with a total length of 37 kilometers caused a strong drainage. Due to the low water depth, more and more trees and shrubs can establish, which increases the risk of fire in the region. Degraded area in Puščia peatland. Photo: Leonas Jarašius. The Puščia peatland has been proposed to the European Commission as a site of Community importance (pSCi). The landscape of the 78.4 hectares is mainly composed of Degraded raised bogs (which may still be capable of natural regeneration) and Depressions on peat substrates of the Rhynchosporion. Since the 1970s industrial peat mining took place here. A dense network of drainage ditches (total length: approximately 35 kilometers) leads to unfavorable hydrological conditions. 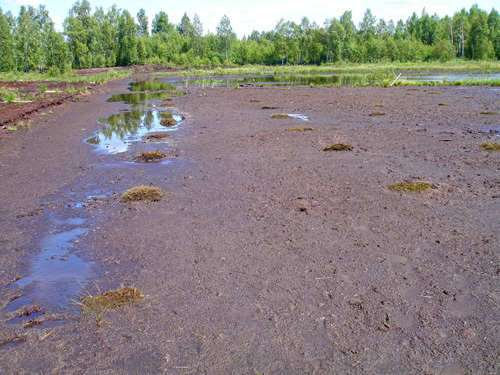 Meanwhile the typical peatland vegetation is severely damaged. Initial restoration attempts had marginal effects so far. The central areas of the peatland area are now overgrown by forest. Former peat mining area in Aukštumala peatland. Photo: Leonas Jarašius. 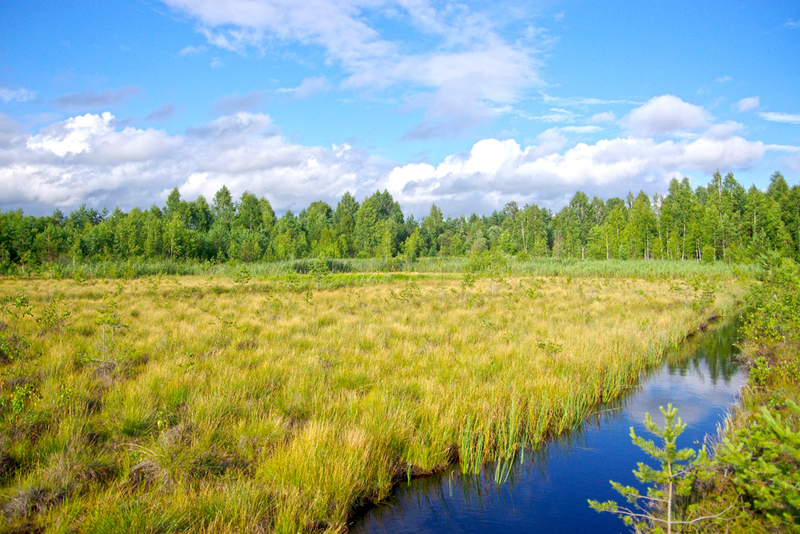 Aukštumala peatland is the smallest project area with 10.2 hectares. It is part of the Nemunas Delta Regional Park, Ramsar area and NATURA 2000 bird protection area. Due to the intensive peat mining there are no NATURA 2000 habitat types. While the peat layer in the elevated wetlands is on average 6.1 meters, only 0,5 to 1 meter peat deposits are left in the project area. At the end of the 19th century, a peat mining factory was built in the southeast of the area. At the end of the 1960s, roads, water pumping stations and dams were built, which caused the drainage of two thirds of the peatlands area, which was subsequently designated for industrial peat cutting. Although peat mining was abandoned ten years ago, extremely high emission values are still being measured due to unfavorable hydrological conditions and the mineralization of the peat layer. In addition, there is an increased risk of fire in the dry seasons. Once, peat was used for construction, in medicine, in food production and as insulation material in houses (dried peat moss). Peatlands also served as a shelter for people during the war. At the beginning of the 19th century peat usage was intensified. Peat was increasingly regarded as fuel and litter in agriculture. The intensification of the drains increased between 1919-1940, in order to gain areas for pastures and meadows (2). In 1940, the peat industry was nationalized in Lithuania, so that many peat mining companies have been established. Since Lithuania’s independency, peat mining declined in 1990, but increased again in 2000 and amounted to about 3.16 million cubic meters by 2008. Today about 80 percent of the peat is exported to European countries (3). Overview of drained peatland in Lithuania according to calculations of Barthelmes et al. 2015. Today approximately 434 x 10³ hectares of peatland area are drained. Of these, approximately 82 percent of the fen area, just under 90 percent of the transitional peatlands and approximately 94 percent of the bog area (1). 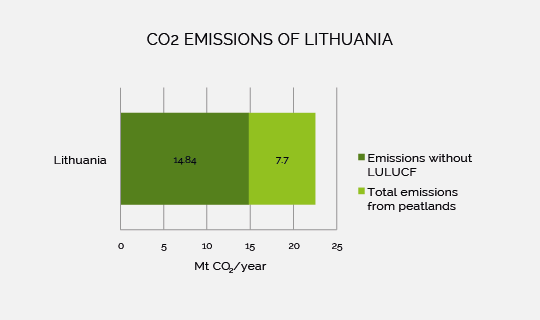 The high drainage rates in Lithuania lead to increased CO2 emissions. A total of 7.24 megatons CO2 are emitted from the degraded bogs, which corresponds to an additional CO2 quantity of 2/5 of the total emissions without LULUCF (1). 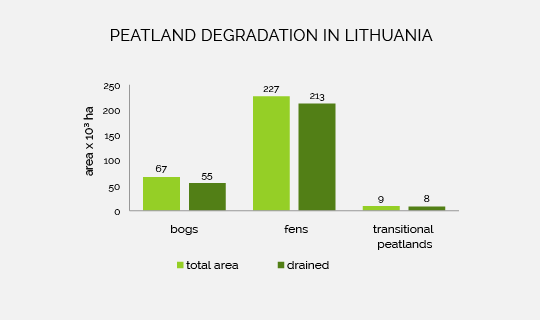 If the CO2 emissions per hectare of degraded peat are considered, Lithuania ranks 10th among the largest emitters with 0.93 tons (4). 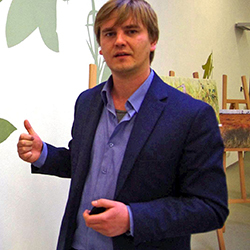 Nerijus Zableckis ist the national project coordinator and expert. He is working for many years for environmental NGOs on habitat restoration issues. 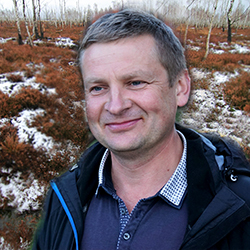 Leonas Jarašius is peat land restoration expert. He has been mire ecologist since the university studies. Jūratė Sendžikaitė is mire expert. 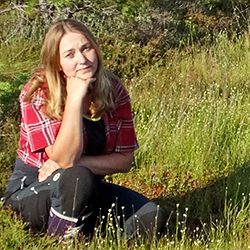 She has ten years experience in mire vegetation research and ecological restoration studies. 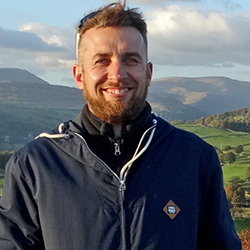 As the assistant of the project manager Žydrūnas Sinkevičius has many years experience in nature conservation. The Lithuanian Fund for Nature (LFN) is one of Lithuania’s first conservation organizations, founded in 1991 after the collapse of the Soviet Union. LFN is cooperating with institutions at national, municipal and private levels as well as with scientific and non-governmental organizations. Their focus is on the protection of biodiversity and the restoration of destroyed ecosystems. Furthermore, the preservation of a good ecological status of the Baltic Sea and the prevention of the spread of invasive species are objectives of the organization. The LFN already managed three LIFE projects. The Peat Producers Association (PPA) was founded in 1994 by a number of peat mining companies to improve the conditions of the peat industry and the exploitation of peatlands. They provide information on sustainable peat utilization and organize seminars and exhibitions on peat mining. As a member of the International Peatland Society, the PPA is committed to the restoration of degraded peatlands. The Ministry of Environment of the Republic of Lithuania is the Lithuanian co-Financer of LIFE Peat Restore. Mierauskas P. & Taminskas J. (2014). Lithuania. In: Joosten H., Tanneberger F. and Moen A. (eds): Mires and peatlands of Europe: Status, distribution, and nature conservation. Schweizerbart Science Publishers, Stuttgart.